Critical Peak Pricing (CPP) is an optional program offered by Southern California Edison that allows businesses to receive significantly lower prices in the summer (June 1 – September 30). Lower summer rates are given in exchange for higher prices throughout 12 designated CPP events during the year. These events typically happen on non-holiday weekdays between 4 p.m. and 9 p.m. and are generally triggered by extreme or unusual spikes in temperature. For example, if a business typically pays a summer rate of $0.41/kWh and they decide to enroll in CPP for the following year, their new rate could be reduced to $0.30/kWh for this 4-month time period. 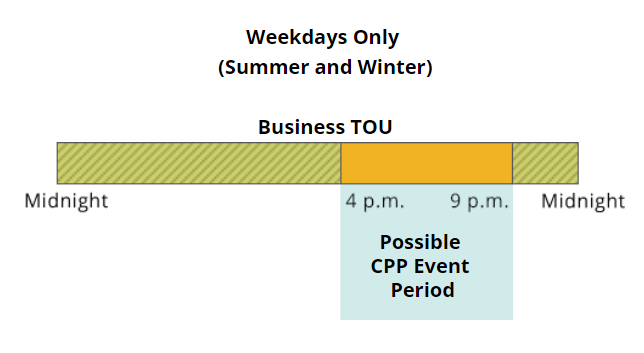 However, if a CPP event was called, their rates on these specific days would rise to $0.80/kWh during the hours of 4p.m. – 9p.m.